Gennadi Rozhdestvensky is a well-known quantity in the Russian repertoire, but not necessarily a conductor one associates with Honegger. But, although I haven’t researched specifically Honegger’s biography and his attitude towards Communism and the Soviet Union, he was a composer with leftist tendencies and a pacifist, so I wouldn’t be surprised if he had been a composer enjoying some currency there. Also, I find much in common between the music Shostakovich and Honegger, cogent but simple architectures, an appeal to the basic emotions. No wonder then that in 1947, Shostakovich transcribed Honegger’s Symphonie liturgique for two pianos shortly after its composition (it has now been recorded, on Guild, GMCD 7331, paired with Messiaen’s Visions de l’Amen, barcode 795754733129 – link will open new tab to the CD’s page on Guild’s website), and that the great Yevgeni Mravinsky left a famous recording of the same Liturgique (in its original form of course, live 1965, Melodiya). And a perfect match on disc (but one that was never done) would be the Second symphony for strings, Bartok’s Divertimento and Shostakovich’s 8th String Quartet in Rudolf Barshai’s arrangement for string orchestra. So maybe it isn’t a surprise after all to see Rozhdestvensky tackling Honegger. 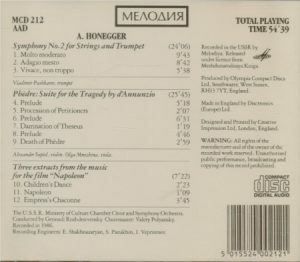 This is not the only Honegger he recorded either: I’ve reviewed the companion disc, with Symphonies 1 & 5, published in 1990 by Olympia under the label Melodiya MCD 154 (the Olympia CDs of Melodiya origin were often published under both label names with same barcode, depending, I think, on US or European – or maybe UK – distribution, and it is the case with this one, but I have found no trace of an Olympia counterpart of MCD 154). There, I noted again an interpretive feature that I had already remarked in a number of recent recordings of this conductor: his preference for very deliberate tempos, in the manner of Furtwängler, Klemperer or Barbirolli, but with any sense of sluggishness offset by the remarkable bite and crispness of attack demanded of his instrumental player, enhanced by the incredibly vivid Melodiya sonics, that made you feel that you weren’t sitting with the audience but in the middle of the orchestra (and closer to the back). And the same interpretive features are at play in Rozhdestvensky’s Second Symphony. Not in the “molto moderato” introduction, though. There, he adopts a rather flowing tempo, in the tradition of Munch (his two most significant recordings are with Boston in 1953, on RCA GD60685 (Europe) / 09026-60685-2 (US), and with Orchestre de Paris in 1967 on EMI) rather than of the expansive and brooding approach of Serge Baudo (1960, part of his complete traversal of the symphonies with the Czech Philharmonic for Supraphon) or Karajan (DG 1969). But where Munch whipped up his orchestra to raging fury when came the first movement’s Allegro proper, Rozhdestvensky keeps it quite moderate. But here again, any sense of slugghishness that it may have entailed is dispelled by the powerful vigor of the bows’ attacks on the strings, abetted by the vividness of the sonic pickup: it is Barbirolli even more than the ageing Klemperer that here comes to mind. Likewise Rozhdestvensky offers a slow, doleful second movement, with a profoundly expressive cello desk and solo cello, generating as much breathtaking intensity as Karajan or Munch. His finale is the slowest I’ve ever heard – compare his 5:34 to Karajan’s 4:53, Munch’s 5:04 with Orchestre de Paris or 4:46 with the Boston Symphony -, but again, and for the same reasons, the impression is not once ounce of sluggishness but of massive and implacable power. This is a very personal view of the 2nd Symphony, like no one else’s, but one that I find entirely convincing. 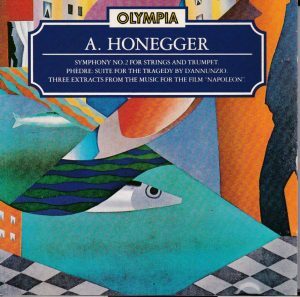 It probably shouldn’t be a first choice (go to Munch or Karajan for that, in two opposing approaches), but any listener seriously interested in Honegger’s Symphony for strings should hear it. The complement of the suite from Phèdre is a further incentive. In 1926 Honegger composed the incidental music to Gabriele d’Annunzio’s Phaedra, a commission of dancer and patroness of the arts Ida Rubinstein (d’Annunzio was the famous Italian poet, also the librettist of Debussy’s Martyrdom of Saint Sebastian, in 1911, written too for Ida Rubinstein). 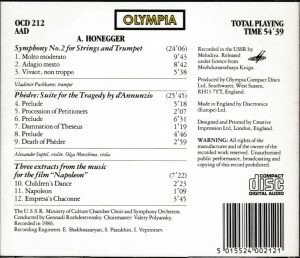 The liner notes claim that “six extracts of Honegger’s score (…) have been arranged in a performing version by Mr Gennadi Rozhdestvensky”, but that must be wrong. It is Honegger himself who extracted that concert suite with six numbers from his incidental music, the score is duly indicated on Salabert’s catalog of Honegger’s compositions (without any mention of Rozhdestvensky) and on another recording, from Erato, Marius Constant plays three of those, and they are exactly the same as Rozhdestvensky’s. Not that this takes anything away from Rozhdestvenky’s recording. 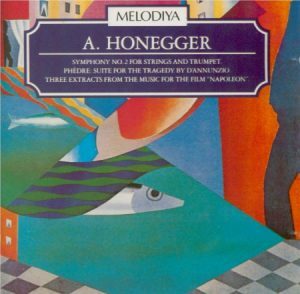 The music is great Honegger, angular, dissonant, brooding, recalling the “experimental” Stravinsky of the Symphony for Wind Instruments. Constant would be ruled out for playing only three out of the six numbers (the last three), especially since the three others are in no way inferior, and anyway, in the shared ones, Rozhdestvensky conducts with marginally more drive and bite and his sonics have considerably more impact – almost too much. On the other hand it is Rozhdestvenky who offers only three frustrating excerpts from Honegger’s score for the Abel Gance gigantic and ill-fated film “Napoleon”. Adriano, on Marco Polo, offers the complete suite, and it turns out that Rozhdestvensky’s selections aren’t the most interesting numbers either. Add that, unlike his Phèdre, Rozhdestvensky here display again the sluggish tempos that seem to be his trademark. His fanfare for Napoleon is solemn rather than heroic and triumphant, his Empress’ Chaconne doesn’t avoid sentimentalism, and he must have found his Children in a Dickens workhouse, so sad, burdened and plangent is their Dance. But the last and jaw-dropping straw is that, incomprehensibly, the recording was obviously dubbed from an LP: you can hear the typical surface scratches throughout. How could they have done that!? And it’s not that it was an old Melodiya recording whose master tapes might have been lost: the recording was made in 1986! But even for the 47 minutes of the Symphony and Phèdre, the CD is worth the purchase. It is to be lamented that Rozhdesvenstky never recorded Symphonies No. 3 & 4, and other symphonic poems.